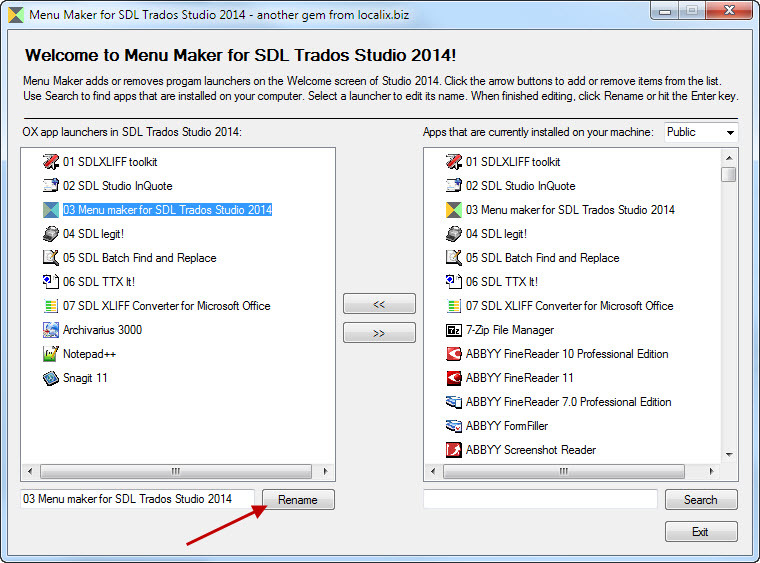 If you installed Open Exchange apps in SDL Trados Studio 2011, you’ll be wondering if they’ll work in Studio 2014. Most of them will. Some may have to be updated by their developers(*), others have been updated already and will automatically appear in the Welcome View of Studio 2014, and another group of apps just need a bit of a helping hand to work in the new environment. Studio apps fall into two categories: plug-ins, which work inside Studio (e.g. MyMemory TM) and standalone apps, which work independently (e.g. PackageReader). To transfer standalone apps, you can now clear them off your desktop and launch them straight from the Open Exchange list in the Studio 2014 Welcome view. How? Download and install Menu Maker from the Open Exchange. This app is specially designed to customise the Welcome view. To do this, open Menu Maker, select any Open Exchange app from the right column (this lists any apps you’ve already installed on your computer) and click on the arrow to add them to the left column (this is your Open Exchange list in Studio 2014). They’re ordered alphabetically, but you can rename them using a number system to sort them in your preferred order. Another feature of Menu Maker is being able to add direct access buttons to programs you access frequently, straight from Studio. Note that you’ll only be able to do this with 32-bit programs. In the screenshot above, you can see I’ve added Archivarius 3000, Notepad ++ and SnagIt to my Studio window. This entry was posted in 2. 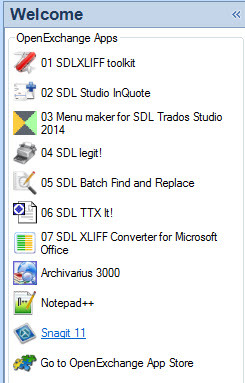 Beyond the Basics, SDL Trados Studio and tagged Open Exchange, SDL, Studio, Studio 2014, Trados. Bookmark the permalink. Nice article Emma… but I would just add that copying the plugins from Studio 10 to Studio 11 will mostly work as you have said, but not always as sometimes the plugins are changed as a result of changes in Studio 2014. So if they don’t work and you get any emails, or posts on this, the best response will be to wait for the developers to update their apps for Studio 2014. Many have been already and I think you can expect to see more over the next few weeks. Thanks, Paul. I’ve added an asterisk to point readers to your comment. My question is, can this methods be applied with the type of file? Or only memory and plugin? Sorry, Tony, I don’t understand your question. What do you want to do with the file type? Thank you very much for sharing the experience, excellent.